Please download a copy of our new sponsorship brochure. You'll learn how you can help the science fair through monetary, in-kind donations or volunteering your time and talents. We need your help. To insure the successful continuation of this event, the USEF is looking for sponsors to provide monetary and non-monetary support. Monetary donations will be used to assist in covering the fair's operational expenses and the travel expenses to send the regional fair winners to the Intel International Science and Engineering Fair. Non-monetary donations include providing an award or awards for a scientific category, door prizes, or free giveaways for the students, teachers, and parents (i.e., pins, folders). Category awards may include cash scholarships, savings bonds, non-tangible awards (i.e., tour of a high tech laboratory), or science industry-related prizes (i.e., computer systems, microscopes, reference manuals). All donations are tax deductible. To become a sponsor, please contact Jody, Fair Manager at (801) 585-9109. If you'd like, you can contribute to USEF now by using the University of Utah's U-Give Program. Thank you! According to a May 2001 National Science Foundation (NSF) report entitled, "Science and Engineering Degrees: 1966 to 1998", the number of college students receiving bachelor degrees each year, in either engineering or physical science, has remained stagnant or has been in decline. In 1998, a total of 60,914 college students received bachelor degrees in engineering. This number is at its lowest level since 1980. We are here, and you are here, because we are trying to make a change. 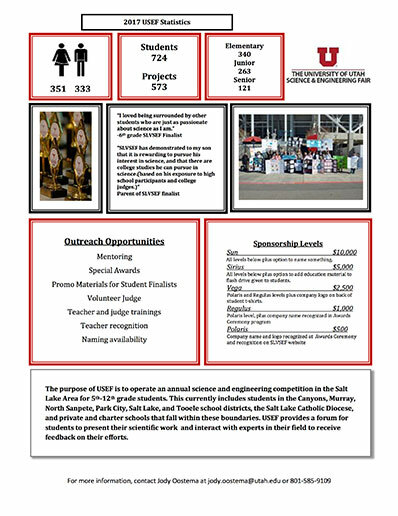 The University of Utah Science & Engineering Fair is affiliated with the Intel Science Service organization. This allows the selected winners from our fair to participate in the International Science & Engineering Fair (ISEF). To succeed in this endeavor, the USEF and University of Utah are soliciting monetary and in-kind support from local organizations. Our organization needs your assistance to provide cash prizes for the winners and supporting the future of the fair. With the help of University of Utah departments and you, USEF plans on providing the first, second, and third place winners of each category in the Senior & Junior divisions with a cash prize. Donations are also needed to cover cost of the fair. Volunteers are needed to assist in the judging of one or more divisions. Register to become a judge by visiting the link below. The University of Utah and USEF are each a 501(c)(3) non-profit organization, so all contributions are tax-deductible. Donated awards will be placed in the sponsors name and may be presented by a representative of the sponsor during the awards ceremony. Sponsoring businesses will receive recognition via our website, at the fair, and in the printed awards program. We look forward to your support!